I’ve always wanted to go to Palawan! …..is what two of my best friends told me after I decided to head there instead of my original plan of going to Thailand. The Philippines came onto my travel radar when I was travelling in Myanmar last year, and since then I kept seeming to hear it about it and meeting Philippinos and feeling like I was being sent a message from the gods to go to the Philippines. However, I only had a vague idea of where it was – I knew it was somewhere to the right of Indonesia, but it’s made up of so many small islands (over 7000) that I found it hard to wrap my head around what bits are the Philippines. Booking my ticket didn’t require much decision making, and it took me about an hour of google searches, using words like ‘best, beaches, philippines’, and Palawan kept coming up. I read a few blogs and looked at some pictures, and looked at some more pictures, and that was enough. I booked a flight from Tokyo to Manila for 24 000 yen (about $180) and then an internal flight to Palawan for just over 10 000 yen, and was set. I flew with Jetstar and the flight was cheap for a reason. I wrote a long rant about why it was such a shoddy experience, but decided not to include it, but it seems like Jetstar actually make a concerted effort to make the experience as painful as possible. In comparison to other places that I’ve travelled in South East Asia – Thailand, Laos, Vietnam, Myanmar, India. Palawan seems a bit more geared towards couples on a 2 week break than backpackers or people who are looking for something a bit less extravagant and a bit more social. My opinion might be a bit skewed by the fact that I was travelling on a motorbike and therefore met less people, which was a double edged sword, as I got to stop and take photos wherever I wanted and ended up in a few places that I would never have seen were I on public transport, like the funeral party that I gatecrashed thinking it was a restaurant. Still they fed me, offered me beer and we had a few laughs - mostly at my expense. But it also means that chances to meet local people and travellers on public transport, which can often be one of the highlights of travelling, were limited. In 3 weeks it is difficult to see everything in Palawan and I would like to go back and spend more time in the less touristic South of the island, and to learn more about the culture aside from the touristic areas. In retrospect maybe seeing the North using public transport for a couple of weeks, then travelling round the south by bike would have been a good way to do it, but I would have needed an extra week to see everything I wanted to. My route started in Puerto Princessa, the capital city. It is made up of a few big, noisy, dirty roads off of which lie clusters of small rural villages linked by dirt roads teeming with dogs, chickens and kids. I stayed in Puerto Princessa for 2 nights in a great hostel called Bamboo Nest that I booked through Airbnb, and cost about $10 per night. I rented a motorbike on the second day, and drove out of town to get a feel for the bike before setting off up North. Maybe heat sensitivity is a sign of aging, but the heat in The Philippines felt like nothing I’ve experienced before except maybe in Israel in the height of summer. So my biggest lesson from my little adventure, was to keep covered, as the backs of my hand got so burnt that they swelled up like bread in an oven and my ankles and neck took a hammering too. On the third day I woke up at 7am, loaded up my bike and headed in the direction of El Nido at the Northern tip of the island. As was the case with pretty much every journey I did, I severely underestimated how long it would take to get there – I planned for 6 hours, but it ended up taking 10. I didn’t stay in El Nido as I had already booked a place a resort called Tapik on a beach called Sibaltan which is on the other side of the island to El Nido. Sibaltan was, according to the website, an hour drive from El Nido. Arriving in El Nido at 6pm after a 10 hour bike ride, I decided to push through and hope that the impending darkness wouldn’t impact too heavily on my attempt to get there. The lack of road signs combined with the lack of roadside lighting and unpaved roads with the occasional river crossing by way of a couple of shonky old wooden planks, kept reminding me that I had probably not made the right decision. When I eventually arrived on the beachfront at Sibaltan, there was little to indicate where Tapik was. As soon as I hit the beach, the first thing I saw was a graveyard on the beachfront, which gave me the feeling that I was on the set of a zombie B-movie. There were some lights in the distance so I rode along the shoreline towards them and eventually found Tapik – a small oasis of monied up foreigners sitting at a cosy looking beachside restaurant. I got some much needed and slightly overpriced food, a shower and a very nice tent with a proper mattress and a dodgy zip – which the staff didn’t seem at all surprised about the fact that I’d broken it after the first night. I was exhausted and slept for about 12 hours. Sibaltan is a beautiful place with not a lot going on. I seemed to be the only single person there, and I think I may have appreciated the serenity a bit more were I not travelling alone, as it felt designed more for couples. 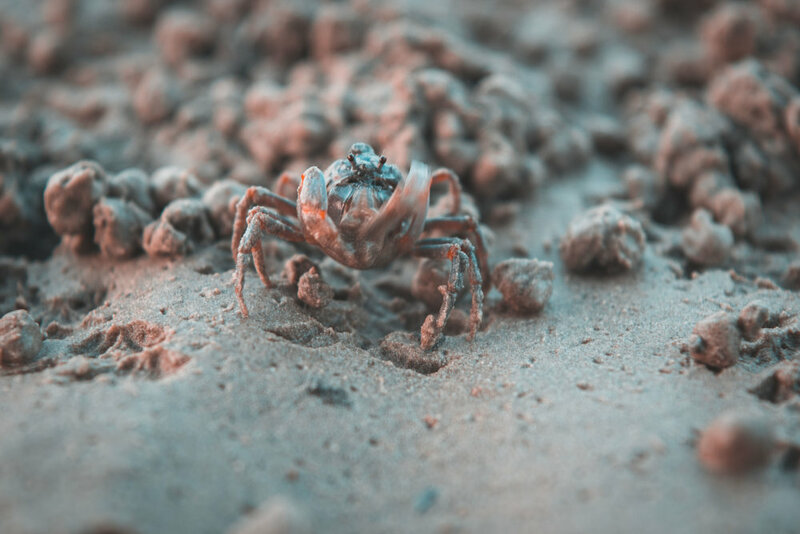 I stayed for 2 nights and the highlight was taking photos early in the morning, which aside from the view, is the time when thousands of tiny crabs come out to have a look around as they cover the beach making a crackling sound that can be heard along the shoreline. They also make a similar sound when you accidentally step on them (.....sorry crabs...). The town is really quiet with one restaurant, a few houses and not many people about, and unless you are going on an island hopping tour there is little else to do in the afternoon but drink beer, watch the sun slowly go down whilst getting hassled by a hungry monkey tied to a tree. I stayed for 2 nights and on the third day I woke up at about 6 and packed up my gear and headed of towards Nacpan, which was about a 2 hour ride. Nacpan is a long stretch of white sandy beach about a 30 minute drive from El Nido, and is a much more chilled out and attractive alternative, though there is less nightlife. There are a few resorts and a handful of restaurants. I stayed at Jonathan’s which had it’s good and bad points (150 pesos a night to pitch your own tent, or 500 pesos for a bungalow). The good being the food was about the best (150 – 200 pesos for omelette, fish or curry) I had in Palawan and the staff were really friendly and helpful, except when they are trying to shove Christ down your throat – there’s few things that can ruin a beachside breakfast more than a Jehovahs Witness. The bad was mostly circumstantial and probably won’t happen to you – I managed to break my tent and computer screen on the same day, and got bitten like never before by sand flies. The sea is a bit rough but it’s good for a dip and one thing that I highly recommend if you have a motorbike, is putting on your headphones and burning it along the beach – there are so few people and enough wet sand to make it relatively safe. Another Nacpan highlight is the hill at one end of the beach (if you are facing the sea the far left end of the beach) that you can walk up in a relatively short amount of time, and get a really good view of the whole beach from both sides, but watch out for skunks as I heard someone got sprayed bad up there. My next stop was El Nido, which seemed a little over rated. Not to say that it isn’t a beautiful part of the world but it survives on an outdated notion that it is an untouched secret hideaway (that was pretty much my impression from what I’d read online), but it’s basically a few dirty streets full of tourist shops and restaurants. The view from the beach is spectacular when it’s not teeming with tour boats. And the beach just seems like a necessary buffer between the sea and the beach side bars and restaurants. One of the main tourist activities in Palawan is island hopping, where you pay around 500 pesos for a day trip around a pre specified group of islands, with lunch and snorkelling included. El Nido is, according to most travel guides, the place to do this, but most people I met there that had been on the tours, told me that they were disappointing due to the amount of other people and though the sites were beautiful, it was more of a whistle stop tour of a few busy islands and lagoons, which you often have to queue up to get into, whereas tours in other places e.g. Coron, Port Barton, Sibaltan, were less crowded and allowed for more time to chill out, swim relax etc. If you want a bit of nightlife then El Nido is probably your best option in Palawan, but if you are searching for beautiful untouched palm tree lined beaches, then it’s probably the last place that I would choose to visit. I also found the people there to be the least friendly and there was a palpable animosity towards tourists (and I'm sure some people have good reason). Coron instantly felt warmer and more friendly than mainland Palawan, although in retrospect I did get royally fleeced by the tricycle driver who picked me up at the port. It seems to have more life and is less of a tourist trap than El Nido. There are a lot more friendly ‘hello’s’ and smiles, and also things are a little cheaper. There seem to be less couples and it has a bit more of an easy going, laidback feel to it. The only downside is that there is no beach in the town, and to get to one you need to rent a motorbike (for 300 pesos for 3-5 hours – which is more than enough time) or get a tricycle, which is around 500 pesos. It was nice to finally be somewhere that felt like a real Philippino town that was not geared towards tourism. I was happy just walking around and chatting and taking photos of people for the first day. There isn’t a lot to do in town but just walking around a new town and soaking up the atmosphere is one of the highlights of travelling for me. There is a mountain called Mt Tapyas in the centre of Coron with a staircase of about 800 steps and takes about half an hour to climb. Sunset is the most popular time to go and the view is worth the effort. 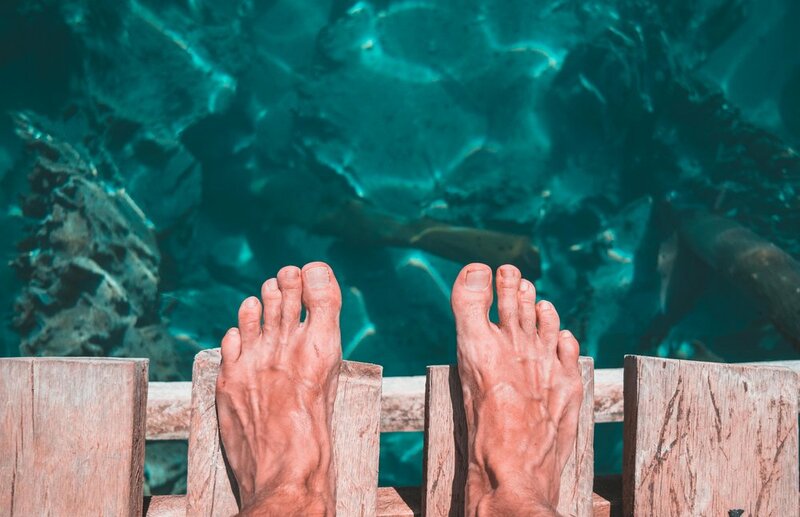 There are also are a couple of trips that you can do out of town – the main ones being the beach and the hot springs – which although it doesn’t sound too appealing on a swelteringly hot day, is worth going to just for the sea side location. I can’t mention Coron without mentioning the main reason that most people go there – Wreck Diving. Around 30 Japanese warships were sunk by American bombers during World War 2 and most of the were around Coron, so most of the tourists come for that and hence the tourist industry in Coron is largely built up around diving. I will write a separate blog post on that, so I won’t write too much here, but it is something that you shouldn’t miss out on if you go to Coron. My final stop was Port Barton and since it was my favourite place I will write a post dedicated to it too. Palawan is a great place to visit and I just scratched the surface. If I were to do it again, I would avoid the bigger tourist areas e.g. El Nido, and would like to see more of the less explored areas in the South. There are also a lot of other places to see in The Philippines, so I’m not sure that I would go back to Palawan before checking out somewhere else first. As far as relaxing beach holidays go, I would still choose Thailand. The Philippines could give it a run for it’s money, but I get the feeling that they are aiming for a higher class of tourist. It still seems like it is finding its feet and is changing pretty rapidly, so now is a good time to go as it is most likely to get more touristy, and more expensive.